(ca. 1890-1900) is a famous rope bridge near Ballintoy. 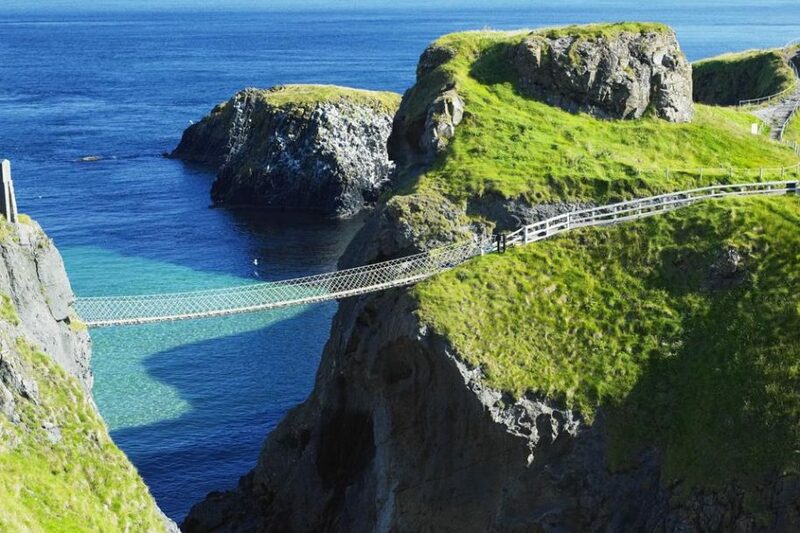 The bridge links the mainland to the tiny island of Carrickarede (meaning “rock of the casting”). It spans 20 metres (66 ft) and is 30 metres (98 ft) above the rocks below. The bridge is mainly a tourist attraction and is owned and maintained by the National Trust. In 2009 it had 247,000 visitors. By 2016 that had increased to 440,000 visitors. The bridge is open all year round (subject to weather) and people may cross it for a fee. It is thought salmon fishermen have been building bridges to the island for over 350 years. It has taken many forms over the years. In the 1970s it had only one handrail and large gaps between the slats. A new bridge was built in 2004 and offered visitors and fishermen alike a much safer passage to the island. The current wire rope and Douglas fir bridge was made and raised early in 2008 at a cost of over £16,000. There have been many instances where visitors, unable to face the walk back across the bridge, have had to be taken off the island by boat. It is no longer used by fishermen during the salmon season, which used to last from June until September, as there are now very few salmon left. In the 1960s, almost 300 fish were caught each day, but by 2002, only 300 were caught over the whole season. The salmon come through the area to spawn in the river Bann and the river Bush. The area is exceptional in natural beauty with stunning views of Rathland Island and Scotland. The site and surrounding area is designated an Area of Special Scientific Interest for its unique geology, flora, and fauna. Underneath there are large caves, which once served as home for boat builders and as shelter during stormy weather. Carrickarede island is the best example of a volcanic plug in Northern Ireland. Marine erosion has exposed a section through the neck of this old volcano.